These sturdy and roomy 16-foot boats are licensed to take up to 8 people and make a comfortable and roomy 4 person boat. These boats have a cuddy in the bows which gives some projection from the weather. They have tiller steering with a powerful 10 hp Mariner outboard. 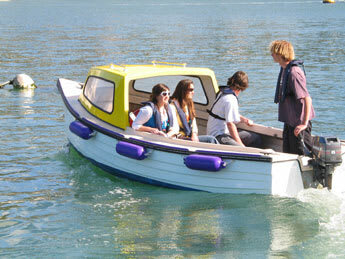 These boats are with their bench seats, ideal for fishing and with the extra space, dogs are also welcome to. There are two of these fisherman's boats available for charter and they cost £150.00 per day.